6. Graduate Institute of Clinical Medical Sciences, Chang Gung University College of Medicine, Taiwan. Purpose: Parotid cancer is a rare malignancy characterized by a heterogeneous histologic subtype and distinct biologic behavior. The present study aimed to externally validate and compare the performances of the American Joint Committee on Cancer (AJCC) staging system (7th Edition), Carrillo score, and Vander Poorten score in the prediction of tumor relapse probability in a large cohort of Asian parotid cancer patients. Methods: In total, 261 patients who underwent primary surgery for localized parotid cancer between 2002 and 2014 at the four affiliated hospitals of Chang Gung Memorial Hospital were identified. All patients were categorized into different prognostic groups defined by these three models for the comparison of associated relapse-free survival (RFS) rates. Results: The 5-year overall survival, cancer-specific survival, and RFS rates were 82.9%, 86.2%, and 77.5%, respectively. All three models were significantly powerful in discriminating between the tumors of patients in the lowest and highest risk groups. The c-statistic for predicting the 5-year RFS was 0.74 for the AJCC staging, 0.74 for the Vander Poorten score, and 0.62 for the Carrillo score. 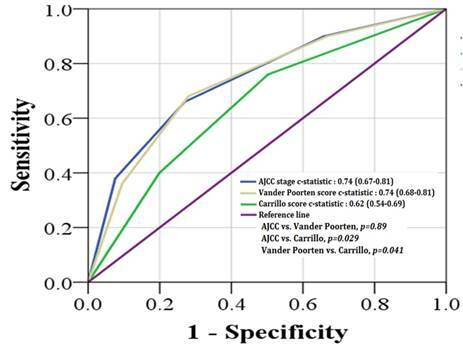 The AJCC staging and Vander Poorten score gave significantly high c-statistic values compared to the Carrillo score. Conclusion: Our data validated that all three models are significantly powerful in discriminating tumor relapse between patients in lowest and highest risk groups. 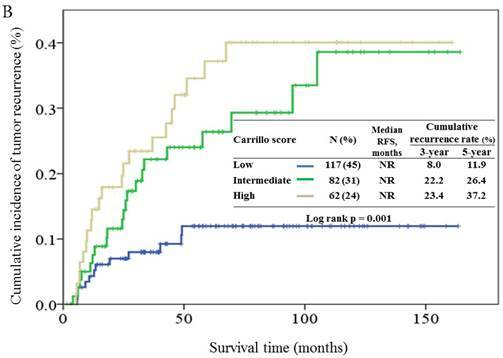 The AJCC system and Vander Poorten score proved superior to the Carrillo score, and showed similar performances in discriminating between the 5-year RFS probabilities of low and high-risk Asian parotid cancer patients. Keywords: parotid cancer, prognostic score, relapse-free survival, validation, comparison. Malignancies of the parotid glands are rare cancers constituting less than 10% of all head and neck neoplasms in the United States . Surgical resection is the standard treatment for localized parotid cancer; however, 5-40% of tumors relapse within 5 years after surgical treatment [2-7]. The wide range of recurrence rates indicates that parotid cancer is a diverse group of malignancies characterized by heterogeneous histologic subtypes, biologic behaviors, and clinical outcomes [8-10]. Therefore, identification of the subset of patients with high risk of tumor recurrence might help determine the appropriate adjuvant treatment following surgical treatment. Owing to their rarity, parotid cancers have not been studied in as much detail compared to the squamous cell carcinomas of head and neck (SCCHN). Similar to SCCHN, they are staged using the AJCC staging system . In addition to the AJCC staging system, which was the most widely used model in predicting survival outcome for parotid cancer, other two risk models were developed for predicting tumor relapse probability of parotid cancer after surgical treatment. In 1999, Vander Poorten et al. 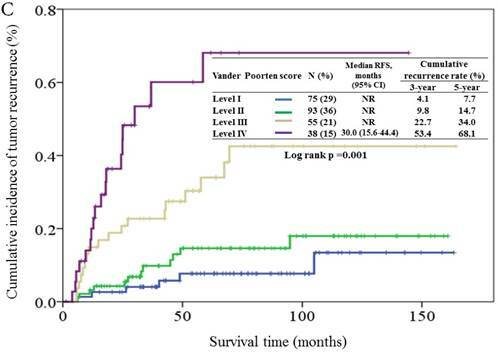 first developed a prognostic model (Vander Poorten score), based on 151 parotid carcinoma patients from the Netherlands, for predicting the relapse risk after surgery . The Vander Poorten score was calculated using seven clinicopathological variables, including age, T-classification, N-classification, facial nerve palsy, skin invasion, surgical margin, and perineural invasion. The model's performance was subsequently validated in 231 parotid cancer patients from the same country in 2003 . In 2007, Carrillo et al. developed another prognostic score (Carrillo score), based on 127 parotid carcinoma patients from Mexico, for predicting the probability of tumor recurrence . The Carrillo score was calculated using five clinicopathological variables, including age, tumor grade, facial palsy, surgical margin, and T-classification. The Vander Poorten and Carrillo scores were directly compared in a cohort of 175 parotid cancer patients from Brazil; however, both models were not totally reproducible . To the best of our knowledge, the accuracies of the AJCC staging system, the Carrillo score, and the Vander Poorten score in predicting tumor recurrence probability were never investigated and directly compared, especially outside the Western countries. The present study aimed to externally validate and compare the performance of these three models in predicting the probability of tumor recurrence in a large cohort of Asian patients with parotid cancer. In total, 261 patients who underwent primary surgery of localized parotid cancer between 2002 and 2014 at the four affiliated hospitals of Chang Gung Memorial Hospital were identified from the institutional cancer registry database. The diagnosis of parotid cancer was confirmed and reviewed by expert pathologists according to the 2005 World Health Organization (WHO) classification . Patients who had partial incision of tumor, recurrent tumors, prior radiotherapy or chemotherapy, and metastatic tumors, were excluded. The surgical strategy for the treatment of parotid cancer (e.g., partial or total parotidectomy with or without facial nerve preservation) was determined by the surgeon based on tumor location, histologic type, and free resection margin. The adjuvant treatment strategies, including radiotherapy and/or chemotherapy, were determined in a multidisciplinary cancer team conference based on poor prognostic factors (positive resection margin, perineural invasion, facial nerve invasion, or lymph node metastases). The patients' demographic characteristics and clinicopathologic variables used in calculating the Vander Poorten and Carrillo scores were collected retrospectively. The study outcome was determined by RFS, defined as the time from primary surgery to the date of tumor relapse on the basis of clinical or radiologic examination. The overall survival was calculated from the date of surgery to the date of death, or the date last known to be alive. Cancer-specific survival was defined as death due to cancer. The dates of the primary cancer diagnosis, primary surgery, and death of each patient were obtained from the institutional cancer center registry or the National Register of Deaths Database in Taiwan. Patients were followed until death or until the end of the study (May 31, 2015). The study was approved by the Institutional Review Board in compliance with the Helsinki Declaration (1996). Basic demographic data were summarized as n (%) for categorical variables, and mean with range, standard error (SE), or 95% confidence interval (CI) for continuous variables. Eight predefined variables, including age, surgical margin, T-classification, N-classification, perineural invasion, facial palsy/invasion, histological grade, and skin invasion, selected from the Vander Poorten and Carrillo scores, were evaluated by univariate analysis (Kaplan-Meier method) to ascertain the impact of each variable on patient RFS. All of the variables in univariate analysis with p values < 0.20 were further analyzed using a multivariate Cox proportional hazards model with backward selection. All patients were categorized into different prognostic groups defined by the Vander Poorten score , Carrillo score  and the AJCC staging system . The point-based scores and the respective prognostic categories for each model are detailed in Table 1. The difference between the patients' demographic data of our study cohort and other cohorts was determined using the Pearson chi-squared (χ2) test, or the Fisher's exact test if the number of variable in any cell was less than five. The Vander Poorten score was divided into prognostic scores of 1 and 2 (PS1 and PS2). PS1 and PS2 were calculated using the characteristics of patients before and after surgery, respectively. PS2 model was chosen in this study because it included the histopathological characteristics of the tumor, enabling a more accurate prediction. Survival outcome for each prognostic group was calculated according to the Kaplan-Meier method. Log-rank tests were used to determine significant differences between the survival curves. Receiver operating characteristic (ROC) curves and the area under the curve (c-statistic) for the outcome of 5-year relapse-free probability were calculated to determine the performances of these three prognostic models. All statistical analyses were performed using SPSS 17.0 software (SPSS Inc., Chicago, IL, USA) and a p value < 0.05 was considered statistically significant. The distribution of demographic and clinical variables in our patient cohort and other cohorts used in the development of the Vander Poorten and Carrillo scores, are compared in Table 2. In our cohort, the mean age was 48 years (range, 7-91), and 146 patients (56%) were men. The most common histological subtype was acinic cell carcinoma (25%), followed by mucoepidermoid carcinoma (24%), and adenoid cystic carcinoma (16%). The distribution of the T-classification was 31%, 42%, 18% and 9% for stages T1, T2, T3, and T4a, respectively. In total, 43 patients (16%) had lymph node metastases. Accordingly, the distributions of AJCC stages I, II, III, and IVa, were 30%, 36%, 21%, and 13%, respectively. All patients received curative surgical resections, and 164 patients (63%) received postoperative radiotherapy. In addition, 59 out of 164 patients (23% of our cohort) received postoperative concurrent chemoradiotherapy. Compared to the demographic data of the other two patient cohorts, our patient cohort was characterized by younger age, lower proportion of facial nerve palsy, and treatment with postoperative radiotherapy, while having a higher proportion of well differentiated tumor grade, receiving surgical modality with superficial parotidectomy as well as postoperative concurrent chemoradiotherapy. The point-based score and categories of the prognostic groups based on the 7th Edition of the AJCC staging system, Carrillo score and Vander Poorten score. Comparison between the distribution of demographic and clinical variables of our patient cohort and other cohorts that were used in the development of the Vander Poorten and the Carrillo scores. With a median follow-up period of 57.5 months (range, 1.4-163.4), the estimated 5-year overall survival, cancer-specific survival and RFS rates were 82.9%, 86.2%, and 77.5% respectively (Figure 1). There were 54 recurrences, including 14 local, 10 regional, and 30 distant. Univariate analysis identified all preselected variables except facial palsy, to have p values < 0.20 for predicting tumor relapse. However, multivariate analysis identified perineural invasion, tumor grade of histological differentiation, and T-classification of TNM stage as the only independent prognostic factors for tumor recurrence (Figure 2). Based on the AJCC staging system, the cumulative incidence of tumor recurrence in patients with different cancer stages is shown in Figure 3A. The 5-year recurrence rates in stages I, II, III, and IVa were 7.6%, 15.8%, 29.0%, and 68.6%, respectively. The hazards ratios for the comparison of stages II, III, and IVa to stage I were 2.17 (95% CI, 0.78-6.04, p = 0.14), 4.80 (1.74-13.2, p = 0.002), and 16.9 (95% CI, 6.27-45.3, p < 0.001), respectively. Based on the Carrillo score, 45%, 31% and 24% of the patients were assigned to the good, intermediate, and poor prognostic groups, respectively. The cumulative incidence of tumor recurrence in patients from different prognostic groups is shown in Figure 3B. The 5-year relapse rates for the good, intermediate and poor prognostic groups were 11.9%, 26.4%, and 37.2%, respectively. The hazards ratios for the comparison of the intermediate and poor prognostic groups to the good prognostic group were 2.78 (95% CI, 1.37-5.66, p = 0.005), and 3.69 (95% CI, 1.81-7.49, p < 0.001), respectively. Based on the Vander Poorten score model, 29%, 36%, 21%, and 15% of the patients were assigned to level I, II, III, and IVa prognostic groups, respectively. The cumulative incidence of tumor recurrence in patients of different prognostic groups is shown in Figure 3C. The 5-year relapse rate for levels I, II, III, and IVa prognostic groups were 7.7%, 14.7%, 34.0% and 68.1%, respectively. 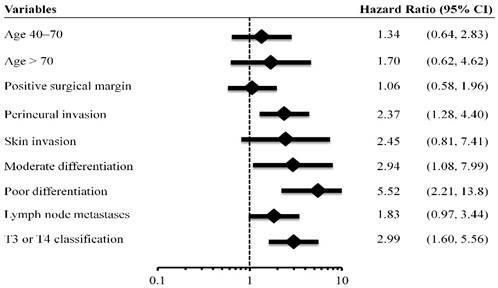 The hazards ratios for the comparison of levels II, III, and IVa prognostic groups to level I were 1.77 (95% CI, 0.66-4.71, p = 0.26), 5.22 (95% CI, 2.07-13.2, p < 0.001), and 12.9 (95% CI, 5.06-33.1, p < 0.001). The c-statistic for predicting 5-year RFS was 0.74 (SE, 0.04) for the AJCC staging, 0.74 (SE, 0.04) for the Vander Poorten score, and 0.62 (SE, 0.04) for the Carrillo score. The AJCC staging and Vander Poorten score showed similar performances (p = 0.89) in discriminating between the 5-year RFS of low and high-risk patients. Both scores gave significantly higher c-statistic values than the Carrillo score (Figure 4). 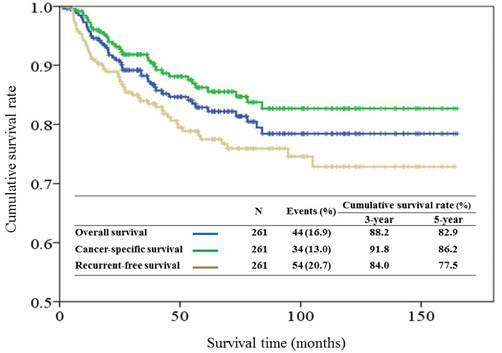 Kaplan-Meier overall survival, cancer-specific survival and recurrent-free survival curves for patients with parotid gland cancer after surgical resection. Multivariate analysis of patient characteristics. (95% CI indicates 95% confidence interval). Cumulative incidence of tumor recurrence curves for different prognostic groups based on the 7th AJCC staging system (3A), Carrillo score (3B), and Vander Poorten score (3C). NR, not reach. Receiver operating characteristic (ROC) analysis using the AJCC staging system (blue color), Carrillo score (green color), and Vander Poorten score (yellow color) for predicting the outcome of 5-year relapse-free survival probability. The present study externally validated and directly compared the performances of the AJCC staging system, Carrillo score and Vander Poorten score in predicting the recurrence of parotid cancer after radical surgery, using a large Asian patient cohort with parotid cancer. Our data validated that all three models could discriminate between the tumor recurrences of patients in lowest and the highest risk groups. The AJCC staging system and Vander Poorten score showed similar performances in predicting the 5-year tumor recurrence risk, and both were superior to the Carrillo score. The AJCC staging system uses the anatomic extent of the cancer and is widely used for predicting the survival outcome after cancer diagnosis . Our study confirmed the prognostic value of the AJCC staging system in predicting recurrence risk between different cancer stage groups, especially useful in identifying patients in the intermittent and high-risk groups. The 5-year recurrence rates in patients with stage III and IVa disease were 29%, and 69%, respectively. Our study showed that the AJCC staging system could be effectively used to stratify Asian patients with resected parotid cancers, which might be important for determining optimal adjuvant therapy. In addition to the anatomic extent of the tumor, various clinicopathologic factors for predicting tumor recurrence after cancer surgery were identified, including age , tumor grade [3, 18, 19], facial nerve palsy [12, 14,19], perineural invasion , and surgical margin [5, 12]. Our data showed that perineural invasion, histological grade of tumor, and T-classification were the most important predictive factors for the recurrence of parotid cancer after cancer surgery. However, information concerning the impact of the clinicopathologic factors on tumor recurrence was mixed in the literature. For example, increasing age is an independent factor influencing survival outcome [12, 14, 19]. Age was reported to be a good prognostic factor for predicting tumor recurrence based on a study conducted on 301 patients with major salivary cancer from Memorial Sloan Kettering Cancer Center . In our study, the association between age and tumor recurrence was statistically insignificant. Because of the limitations including small patient numbers, variations in the eligibility criteria, differences in analytic variables, and lack of uniform criteria for enrolling patients in postoperative treatment, a well-designed, multicenter, prospective study is necessary to identify the exact prognostic factors for tumor recurrence in parotid cancer after surgical treatment. Owing to distinct tumor subtypes and heterogeneous clinical behavior of parotid cancer, the AJCC staging system is inherently limited because it overlooks other clinicopathologic characteristics that might influence tumor recurrence. Both the Carrillo and Vander Poorten scores were developed using the combination of the clinicopathologic factors and the anatomic extent of tumor with the intention of overcoming the limitations of the AJCC staging system in predicting recurrence risk for patients with parotid cancer. A comparison of the c-statistic values of the AJCC staging system and Vander Poorten score, showed they had similar performances in predicting the 5-year RFS probability. The performance of the Carrillo score was less accurate than the AJCC staging system. Our study showed that including other clinical variables in addition to the T- and N-classifications did not increase the clinical accuracy compared to the AJCC staging system. This might be attributed to differences in demographic data and postoperative treatment strategies between our patient cohort and other cohorts used in developing the Vander Poorten and Carrillo scores. Tackling too many variables and complicated score computing system of both Carillo and Vander Poorten scores limited their usefulness in daily practice. The AJCC staging system is as good as the Vander Poorten Score and even better than the Carillo Score in predicting 5-year RFS by using c-statistic values. This suggests that we can simply use the AJCC staging to predict 5-year RFS. The AJCC staging system, so far, is still the simplest and most easily accessible tool in predicting tumor recurrence probability in clinical practice. 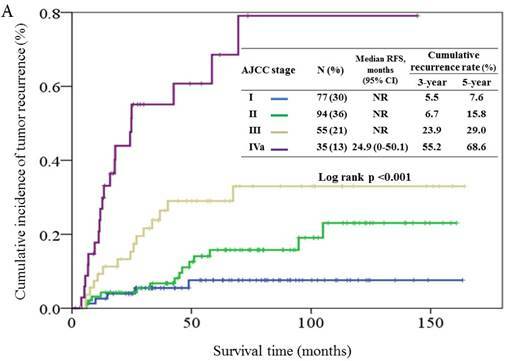 When the cumulative incidence of tumor recurrence was calculated using the AJCC staging system, Vander Poorten score and Carrillo score using data from our patient cohort, all three models exhibited an excellent ability in discriminating the recurrence risk between different prognostic groups. However, both the AJCC staging system and Vander Poorten score failed to stratify risk between patients of the first two low risk groups. The major reason for this result was the small number of events and the low incidence rate in patients from favorable prognostic groups. Therefore, the ability to discriminate between the first two prognostic groups was statistically insignificant. Similar observations were reported in the study by Takahama et al, where the Carrillo and Vander Poorten scores were directly compared on their performance of discriminating relapse risk in patients of the low and intermediate risk groups; Vander Poorten score was shown to have poor performance . Prognostic models are developed to determine patient outcome, predict treatment response, and stratify toxicity profiles in cancer care. An accurate model is useful for determining appropriate treatment modalities and making informed clinical decisions . Therefore, recognizing the performances and limitations associated with these models might assist clinicians in applying these models properly to selected patients. Carillo and Vander Poorten Scores are based on the 6th AJCC T classification. However, the 7th AJCC T staging was placed/introduced in 2010. In the 7th AJCC edition, the T4 lesions were further subcategorized into T4a (moderately advanced local disease) and T4b (very advanced local disease). This leads to additional stratifications of Stage IV to Stage IVA and Stage IVB. Since surgery with curative intent remains to be the mainstay treatment in T4a diseases but T4b, we did not include T4b diseases in this study. However, there was no change in either Carillo or Vander Poorten Scores based on either the 6th or 7th AJCC T classification. Our patient cohort had a better recurrence outcome than patients from other prognostic models. The 5-year recurrence rates were 23%, 38%, and 43% for patients from our study, Vander Poorten cohort, and Carrillo cohort, respectively. The patient cohorts of different models were comparable in their distribution of all clinicopathologic variables. Several differences between our patient cohort and the other patient populations were noted. First, our patient cohort was constituted of a younger patient population. Second, patients with well differentiated histologic grades (44% vs. 17-18%), acinic cell carcinoma subtype (25% vs. 9-15%), and early T-classification (T1 or T2, 73% vs. 26-65%) were more common in our cohort, while facial palsy (8% vs. 19-30%) and vascular invasion (6% vs. 14-27%) were less frequently observed in our patient cohort compared to the other two cohorts, respectively, indicating a better outcome in our cohort. There is no consensus in parotid gland tumors regarding their behaviors in different subtypes. Both Carillo and Vander Poorten Scores deem all subtypes of parotid gland tumors as one disease entity. Our data did not show any significant difference in tumor recurrence in different subtypes using either univariate or multivariate analyses. Third, surgical resection rates in our cohort, the Vander Poorten cohort, and the Corillo cohort were 100%, 95%, and 88%, respectively. Moreover, the patients of the Vander Poorten and Carrillo cohorts underwent more radiotherapy than our cohort (82% and 82% vs. 63%, respectively). Furthermore, recent improvements in modern surgery and postoperative radiotherapy strategies might have substantially contributed to better outcomes , supported by the fact that our patients were treated between 2002 and 2014, whereas the patients from the Vander Poorten and Carrillo studies were enrolled between 1985 and 1994, and 1981 and 2004, respectively. 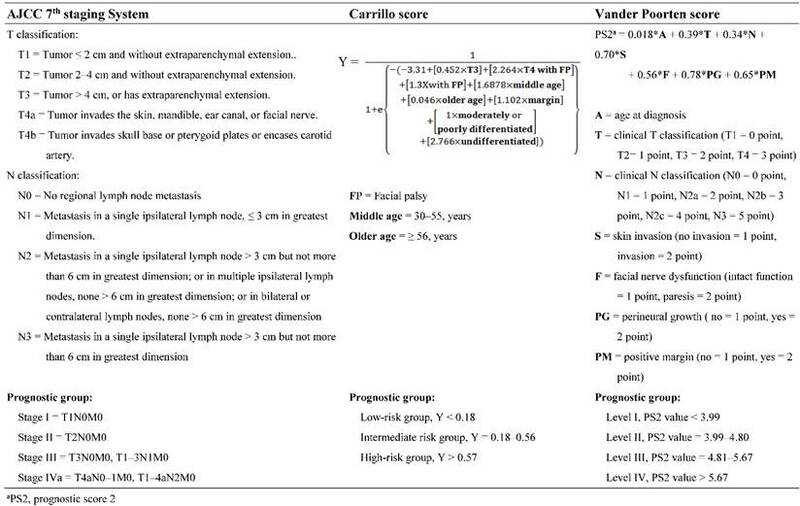 Despite the discrepancies among the three cohorts, the Vander Poorten score was validated as a better prognostic predictive tool compared to the Carrillo score in Asian patients with parotid cancer. The strengths of our study included large patient numbers from multiple locations in Taiwan over a 13-year period. To the best of our knowledge, our study is the first to compare and validate the performance of the three most important prognostic models for predicting risk of recurrence in Asian patients with parotid cancer. However, there are limitations to our study. First, because it was a retrospective study, a selection bias might exist. Second, the tumor recurrence rate was relatively low in our study; therefore, further stratification of patients from the first two favorable groups using either the AJCC staging system or the Vander Poorten score was difficult. Third, most of our patients received postoperative treatment; there was a selection bias concerning which patients would receive the treatment, and the effectiveness of the antitumor therapy might also potentially affect patient outcome. In conclusion, this is the first study conducted to validate and directly compare the performance of the AJCC staging system, Vander Poorten score, and Corrillo score in predicting recurrence of parotid cancer after radical surgery in a large Asian patient cohort. The AJCC staging system and Vander Poorten score showed similar performances in discriminating the 5-year tumor recurrence risk of different prognostic groups; both proved superior to the Carrillo score in our patient cohort. The application of the AJCC staging system or Vander Poorten score might assist the clinicians in appropriately counseling patients as well as selecting patients more likely to benefit from adjuvant treatment. The authors would like to thank all members in the Chang Gung Memorial Hospital Cancer Center for their help in data collection. They would also like to extend their gratitude to Ms. Shu-Fang Huang from the Center for Clinical Research in Chang Gung Memorial Hospital and her team for their invaluable contribution in biostatistics. Disclosure of potential conflicts of interest: This research did not receive funding from any public, commercial, or nonprofit agency. The authors report no competing financial interests. Research involving human participants: All procedures performed in studies involving human participants were in accordance with the ethical standards of the institutional and/or national research committee and with the 1964 Helsinki declaration and its later amendments or comparable ethical standards. Informed consent: For this type of study formal consent is not required. Corresponding author: Wen-Chi Chou, M.D. Department of Medical Oncology, Chang Gung Memorial Hospital, Linkou, 5 Fu-Hsing Street, Kwei-Shan Shiang, Taoyuan 333, Taiwan. Tel: 886-3281200 Ext: 2517; Fax: 886-3-3285818 E-mail: f12986org.tw or wenchi3992com.tw.